This is the trunk railroad bridge over the Crooked River in Terrebonne, Oregon. It can be viewed from the Peter Skene Ogden State Scenic Viewpoint on Route 97. There is parking for big rigs and regular vehicles and the signage warns people to stay with their children and not to let their dogs out of their cars, as many have died going over the edge. The cliff drops straight down, over 300 feet. 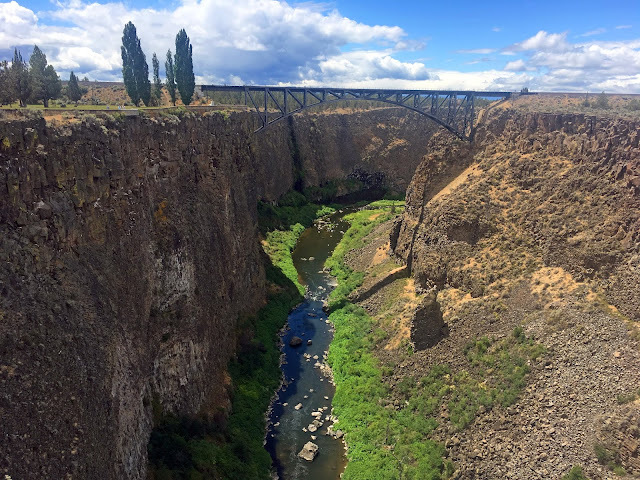 The bridge I took this photo from - called the Crooked River High Bridge - was being used by people who were bungee jumping off of it. Crazy! You can see more photos and a short video in my Instagram post.